Love the bling,bling have to go get it fixed to fit my small wrist so I could enjoy wearing it. This watch goes well with just about any clothing piece you have on. This ladies Akribos XXIV Swiss quartz, luxury watch is a great addition to your collection with its remarkable diamond and crystal design. 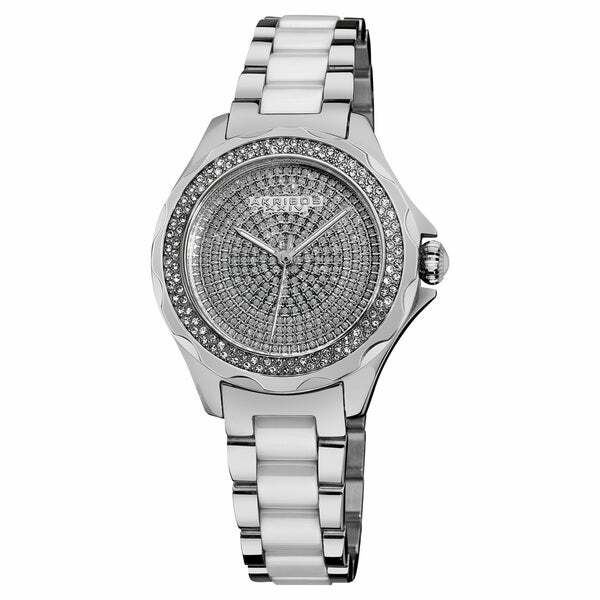 This elegant timepiece features a stainless steel and ceramic bracelet. Dimensions Case measurements: 35 mm wide x 35 mm long x 10 mm thick. Bracelet measurements: 16 mm wide x 7.5 inches long. Received the watch, looks great. Pin missing however that connects band to watch. Purchased as a gift, so did not have time to ship watch back for a replacement. Had to spend extra $ at a watch repair shop to have a pin inserted to replace missing one. Love it!!!! "Class" on my wrist!!!! Really, really "choosy" about watches; but, was not disappointed. Will hopefully purchase another watch from you again. This watch has a very large face. It looked more like a man's watch on my petite wrist. Absolutely gorgeous watch! I wear it with my pearls and it compliments them beautifully!